This is an awesome item for person who loves BBQ’s and rocks out together. Sturdy fork is build to take heat while use on BBQ. It easily holds up barbecues and can also be used for roasting marshmallows or cooking hot dogs. Perfect gift for your rocking husband or male friend. They for sure will love to use (and brag) about it. 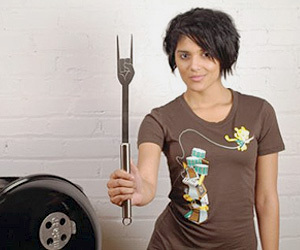 An awesome conversation starter while enjoying hot food direct from BBQ courtesy of this cool looking and very functional rocking BBQ fork. Don’t forget to pair this up with guitar shape spatula to complete the rock musical BBQ setup.